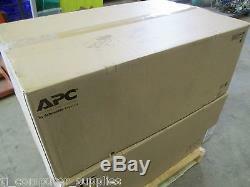 APC Smart Tower UPS SRT6KXLI. Can be converted to Rackmounted UPS with optional kit (not supplied). For full details and description please scroll down and see below. Collection from our premises in person by appointment only. 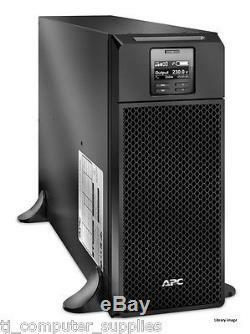 APC Smart-UPS SRT 6000VA 230V. Connect the device to a network using a 10 or 100 BaseT connection. Provides early-warning fault analysis on batteries enabling timely preventive maintenance. Patent-pending operating mode that bypasses unused electrical components in good power conditions to achieve very high operating efficiency without sacrificing any protection. Text and mimic diagrams that display modes of operation, system parameters and alarms. Smart-UPS On-Line Features & Benefits. Protects the initial investment in the UPS when migrating from tower to rack-mount environment. Install maintenance releases of firmware remotely using FTP. Ensures clean, uninterrupted power to the loads when adding extra runtime to the UPS. Provides early-warning fault analysis ensuring proactive component replacement. Warns when a battery is not available to provide backup power. Provides notification of changing utility power and UPS power conditions. Increases availability by allowing a trained user to perform upgrades and replacements of the batteries reducing Mean Time to Repair (MTTR). Periodic battery self-test ensures early detection of a battery that needs to be replaced. Provides temporary battery power when the utility power is out. Ensures clean, uninterrupted power to protected equipment when generator power is used. Gives higher application availability by correcting poor frequency and voltage conditions without using the battery. Protects connected loads from surges, spikes, lightning, and other power disturbances. Minimizes installation costs by enabling the use of smaller generators and cabling. Ensures the product has been tested and approved to work safely with the connected service provider equipment and within the specified environment. Easy recovery from overloads; no need to replace a fuse. Low operating and maintenance costs with proven reliability and intelligent battery management. Intelligent battery management, pioneered by APC, maximizes battery performance and life through intelligent, precision temperature compensated charging. Automatic self tests insure battery reliability and warn customers in advance of battery replacement. Convenient, easy to connect, hot-swappable battery modules provide battery replacement without powering down. Avoids costly power problems by keeping your IT equipment and data protected and available. Network grade power conditioning protects from damaging surges and disruptive noise. The double conversion architecture provides tight voltage regulation, frequency regulation , and zero transfer time to battery during power events. Save time with easy and convenient remote accessibility. Network manageable via serial, USB or optional Ethernet. Includes Powerchute® Network Shutdown Software for convenient monitoring and control, safe operating system shutdown, and innovative energy management capabilities. Peace of mind that comes with full equipment compatibility and reliability of a leader. Provides pure sine wave output which is recommended by server manufacturers using active power factor corrected (PFC) power supplies. Safety agency tested and approved means that you can deploy Smart-UPS with confidence that they meet or exceed the industrys most rigorous standards. Allows additional run time to be quickly added as needed. Maximizes battery performance, life, and reliability through intelligent, precision charging. Supplies utility power to the connected loads in the event of a UPS power overload or fault. Automatic restart of loads after UPS shutdown. Automatically starts up the connected equipment upon the return of utility power. Ensures clean, uninterrupted power to protected equipment while batteries are being replaced. Prolongs battery life by regulating the charge voltage according to battery temperature. Provides management of the UPS via a serial port. Quickly understand unit and power status with visual indicators. Provides remote power management of the UPS over the network. Customize UPS capabilities with management cards. Enables centralized management via the APC InfraStruXure Manager. 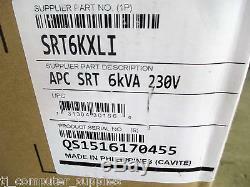 Output power capacity 6.0 KWatts / 6.0 kVA. Max Configurable Power (Watts) 6.0 KWatts / 6.0 kVA. Output Voltage Distortion Less than 2%. Output Frequency (sync to mains) 50/60Hz +/- 3 Hz. Other Output Voltages 220, 240. Load Crest Factor 3 : 1. (6) IEC 320 C13 (Battery Backup). (4) IEC 320 C19 (Battery Backup). Bypass Internal Bypass (Automatic and Manual). Input frequency 40 - 70 Hz (auto sensing). Input Connections Hard Wire 3 wire (1PH+N+G). Input voltage range for main operations 160 - 275 V. Input voltage adjustable range for mains operation 100 - 275 (half load) V. Other Input Voltages 220, 240. Battery type Maintenance-free sealed Lead-Acid battery with suspended electrolyte : leakproof. Typical recharge time 1.5 hour(s). Interface Port(s) RJ-45 10/100 Base-T , RJ-45 Serial , Smart-Slot , USB. Control panel Multi-function LCD status and control console. Audible Alarm Audible and visible alarms prioritized by severity. Emergency Power Off (EPO) Yes. Available SmartSlot Interface Quantity 1. Maximum Height 432 , 43.2 cm. Maximum Width 174 , 17.4 cm. Maximum Depth 719 , 71.94 cm. Net Weight 60.0 kg. Units per Pallet 6.0. Operating Environment 0 - 40 °C. Operating Relative Humidity 0 - 95% no %. Storage Temperature -15 - 45 °C. Storage Relative Humidity 0 - 95% no %. Audible noise at 1 meter from surface of unit 55.0 dBA. Online thermal dissipation 1300.0 BTU/hr. Approvals CE, CE Mark, EAC, EN/IEC 62040-1, EN/IEC 62040-2, ENERGY STAR (EU), IRAM, RCM, VDE. REACH REACH: Contains No SVHCs. The item "APC Smart Tower UPS 6000va SRT6KXLI 6kVA 230V" is in sale since Thursday, June 02, 2016. This item is in the category "Computers/Tablets & Networking\Power Protection, Distribution\Uninterruptible Power Supplies". The seller is "tj_computer_supplies" and is located in Henlow.